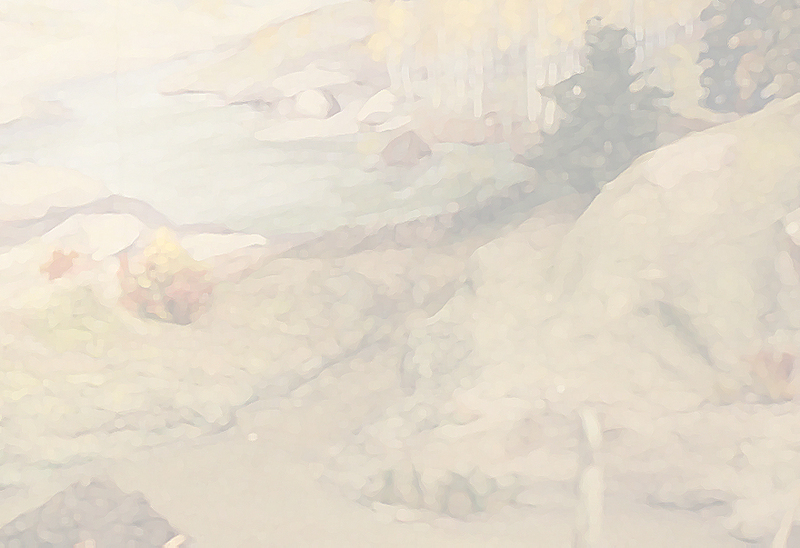 The Map Gallery contains selections from various sources. They can show imagined realities, accurate depictions; historical context or artistic expression. More will be added later. 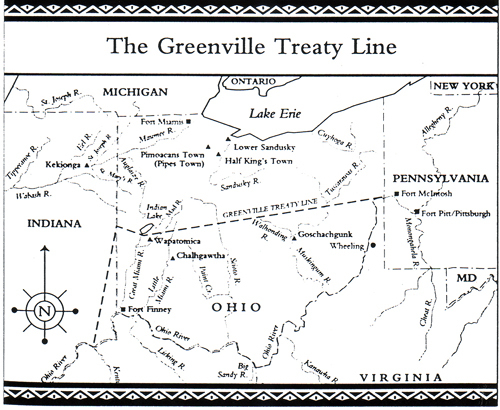 The Greenville Treaty was made between the United States government and the various tribes of the Ohio country during the summer of 1795. 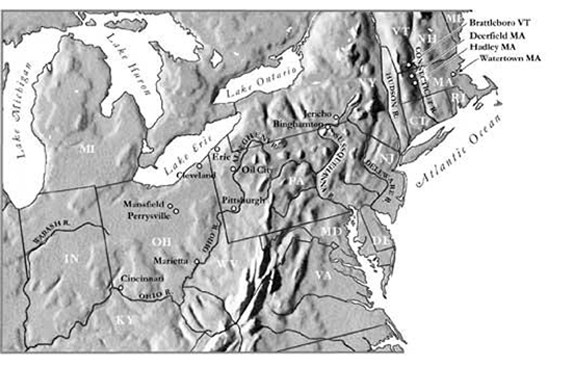 The land to the south of the line was open to settlement and essentially ended the Indian occupation of the region and opened the door to Veterans of the Revolutionary War and land speculators. The agreement included property rights for over 25,000 square miles. The price paid to the Native Americans has been calculated to be about six acres for one cent. This is the region that Jedediah Smith’s family migrated to, in about 1817. 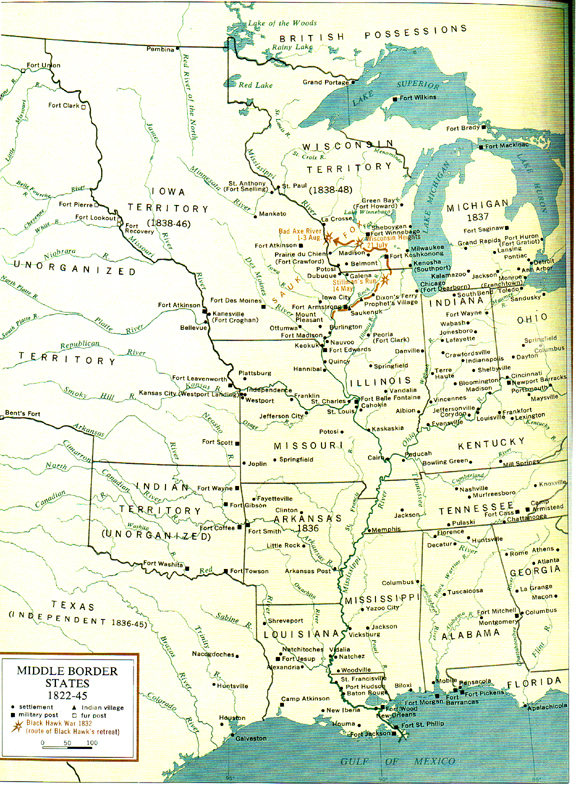 Early settlement in Illinois was concentrated in the southern part of the state. Jedediah Smith’s first journal entry says that he spent the summer and fall of 1821 and the winter of 1821-22 in Northern Illinois, and then came down to the Rock River, before traveling down the Mississippi to St. Louis. The boundary between Illinois and Wisconsin was being negotiated during these months, so it is likely that Smith also spent some time in southern Wisconsin before joining the Ashley Henry Expedition into the Rocky Mountains later in 1822. This map shows the area ranged by Jedediah Smith between his departure from Ohio in the spring of 1821, until the fall of 1822, when he was up on the Missouri River , at the site of Fort Union (which was built after his most active years of traveling the West). His travels on the Ohio and Mississippi Rivers prepared him for the job he was hired for by William Ashley in the spring of 1822. If any journals were written by Smith during these early years of his adventures, none have survived. Jedediah Smith’s ancestors emigrated from England around 1634. Their first home was in Watertown , near Boston , but the families steadily moved west, eventually founding the town of Hadley , Massachusetts . Smith’s father lived in Brattleboro , Vermont for a time, and later moved to Jericho , New York (now Bainbridge), where Jedediah Smith was born. His family moved next to Erie , Pennsylvania , perhaps also Oil City , and by 1817 had purchased property in Perrysville , Ohio . This is where Smith and others set off in a flatboat, with commodities on board, headed down the Ohio River and the Mississippi , bound for New Orleans in 1821.